If you think of privacy, exquisite decor exactly to your taste, authentic laughter, and personal memories that will last forever, all set within a beautiful secluded space, then look no further than the to The Beautiful Tent Company. We supply luxury marquees for weddings across the South West, including Devon, Cornwall, Somerset and Dorset, as well as for private and corporate marquee hire. It’s our aim to create a magical sanctuary for yourself, your spouse and your guests. With our beautiful tents for hire, we go that extra mile to provide a bespoke, personalised ambience to make your wedding dreams come true. Whether you’re hoping for a classic theme, a gothic style atmosphere, or a bohemian festival theme, we take the time to understand what you want for your wedding marquee and we make it happen. With our marquee hire extras, you will be able to dance under the stars with our outdoor flooring, with your very own chill-out zone and a parallel marquee for partying and dining! We are a passionate team that exemplifies quality. Your wedding day should be the one day in your life that you don’t cut corners; the day that you have everything that you’ve ever dreamed of. Our luxury wedding marquees aren’t just tents, they are the setting where true love begins, they are a breathtaking backdrop, they are robust, beautiful structures that offer an awe-inspiring space. Take a look at our gallery for spectacular inspiration for your upcoming wedding. The heavy, spacious white canvas, paired with beautiful lining lends itself to any theme with a luxury feel. From roaring fire pits to fairy lighting, chair and table hire, outdoor dance floors and chill out zones. We will create something unique to you. Something so beautiful that it will leave your guests in awe. We can also arrange the following: generators, heaters, table linen, glassware, crockery, chandeliers, carpets, alternative flooring and toilets. We pride ourselves on being able to offer a one-stop shop to take away the stress of coordination with third-party suppliers. We specialise in weddings, but have also worked some high profile events for the likes of Kirstie’s Vintage Home on Channel 4, T4 on the beach for Claire’s Accessories rebranding launch and a very high profile models wedding! Although based in Devon, we can set up our beautiful tents across the Southwest and further afield. To inquire, simply fill out our contact form and we’ll get back to you as soon as possible. Looking for the perfect wedding dress? 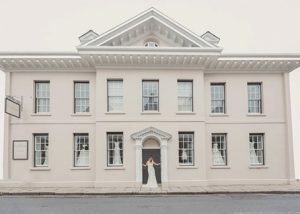 The Bridal House Cornwall has every design and detail you are looking for in your wedding dress Situated in the centre of Truro, Cornwall, the shop is truly stunning and offers a unique setting to try on some beautiful dresses. Why not book yourself into the Bridal House of Cornwall Experience and take some friends along. Strut your stuff on their catwalk and then retire to the library to relax, enjoy some fizz and review your catwalk images! For any brides that book in with us who have booked The Beautiful Tent Company for their luxury wedding marquee, we will give you 10% off your wedding dress and 15% off bridesmaids. This offer is on selected dresses. We look forward to seeing you soon!